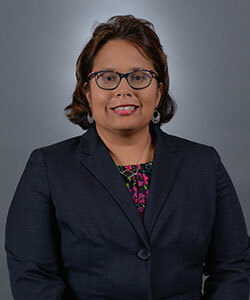 Veronica G. Martinez Acosta joined the Department of Biology faculty at University of the Incarnate Word in August of 2008. She is currently an Assistant Professor of Biology. Veronica graduated from Charles H. Milby Sr. High School (Houston, TX) in 1991. She earned a B.A. in Biology (1996) and a B.A. in Elementary Education (1996) from the University of St. Thomas (Houston, TX). In 2005, Dr. Martinez Acosta earned a Ph.D. in Zoology (Neurobiology) from Texas A&M University (College Station). Following her doctoral studies, she completed a postdoctoral fellowship in the laboratory of Dr. Bing Zang (the University of Oklahoma), then at the University of Texas (Austin, TX), and became a Visiting Assistant Professor at Southwestern University (Georgetown, TX). Dr. Martinez Acosta has studied a rare form of regeneration called neural morphallaxis in the annelid worm, Lumbriculus variegatus and has characterized the effects of aging on the rapid escape neural circuitry of Drosophila melanogaster. Her current research interests include molecular mechanisms governing neural regeneration and morphallaxis and the role of stem cell populations in these regenerative processes. Dr. Martinez Acosta enjoys teaching undergraduate courses in cellular biology, developmental biology, and neurobiology. She also enjoys conducting research with her undergraduate assistants. My laboratory studies neural morphallaxis in Lumbriculus variegatus. This organism is ideal for examining behavioral, physiological, cellular and molecular mechanisms of development, regeneration and systems-level plasticity. We have defined the neural correlates of escape reflexes, which are reconfigured during morphallaxis. As defined by T.H. Morgan (1901), Morphallaxis does not involve cell proliferation, but instead relies on the reorganization of existing tissues to recover body structure and function. Morphallaxis is a mechanism used during segmental regeneration (i.e., head or tail replacement) by the aquatic oligochaete, Lumbriculus variegatus. We have recently characterized morphallaxis of the nervous system as it occurs during segmental regeneration and during asexual reproduction. We have also begun investigations of synaptic molecules up-regulated specifically during morphallaxis using proteomic approaches. Lumbriculus is a model system that also inspires many basic developmental biology questions concerning body axis development and the involvement of stem cell populations in wound repair and regenerative mechanisms. We hope to characterize some of the cellular mechanisms utilized by stem cell populations in Lumbriculus during regeneration. A long term goal of our studies would be to develop a better understanding of the cellular and molecular mechanisms utilized during regeneration in this unique model system such that this knowledge might be utilized for the development of regenerative therapies. Lastly, we also continue the work of the late Dr. Charles D. Drewes (Iowa State University) developing Lumbriculus as a valuable educational tool in the science classroom. Zoran MJ and Acosta Martinez VG (2009). Lumbriculus variegatus and the Need for Speed: A Model System for Studies of Rapid Escape, Regeneration and Asexual Reproduction . In: Annelids as Models Systems in the Biological Sciences (Ed. Daniel Shain). (Invited chapter, In press with Wiley Publishers). Martinez VG, Manson JM*, and Zoran MJ. (2008). Effects of nerve injury and segmental regeneration on the cellular correlates of neural morphallaxis. J Exp Zoolog B Mol Dev Evol. 310(6):520-533. Martinez VG, Javadi CS*, Ngo E*, Ngo L*, Lagow R*, and Zhang B (2007). Age-related changes in climbing behavior and neural circuit physiology in Drosophila. Developmental Neurobiology 67(6):778-91. Martinez VG, Reddy PK*, and Zoran MJ (2006). Asexual reproduction and segmental regeneration, but not morphallaxis, are inhibited by boric acid in Lumbriculus variegatus (Annelida: Clitellata: Lumbriculidae). Hydrobiologia 564: 73-86. Martinez VG, Menger III, GJ and Zoran MJ (2005). Regeneration and asexual reproduction share common molecular changes: upregualtion of a neural glycoepitope during morphallaxis in Lumbriculus. Mech. Devel. 122(5): 721-732.